In every issue of the Official Visitors’ Guide, one Seattle “ambassador” tells us what they love about the city. 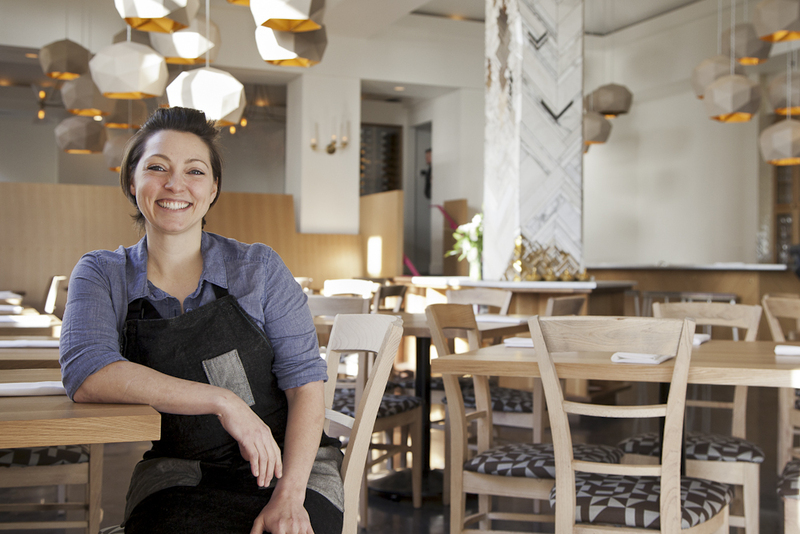 Most recently, former Top Chef contestant Carrie Mashaney dished about how she loves Seattle. Read about where she takes out-of-town guests in our upcoming 2014 summer/fall edition of the guide. 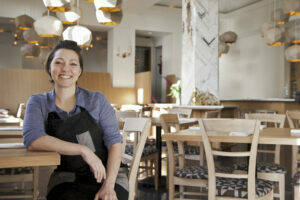 Chef Carrie Mashaney in Aragona, serving Spanish-inspired cuisine in Seattle. Photo courtesy of Aragona. Carrie Mashaney strides out of the kitchen, framed by a shelf of cookbooks and wine guides, wiping her hands on an apron. The Spanish-inspired restaurant—Aragona—is so sleek and modern, and Carrie is so wide-eyed looking. But there’s clarity to her step that says this is her kitchen, her restaurant, and her place, without her having to announce it. We spend a few minutes gushing over our mutual affection for sherry, and exclaiming her luck with wine pairings thanks to the menu. There’s this core that runs through her that makes me want to eat anything she dishes up. Maybe that’s why Jason Stratton chose her to lead his new Aragona restaurant. 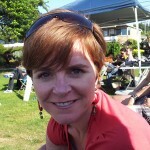 She grew up in the Midwest, but landed in Seattle in 1998 after spending a summer working in Alaska. Even now, Carrie has a fresh-scrubbed Midwestern look that makes you think she’ll be bubbly, but she’s extremely complex—there’s so much going on beneath the surface. Her entire cooking career has been here in the Pacific Northwest, which means she knows her way around shellfish. Over the past 16 years she has worked—among other places—as a pastry chef at Café Juanita, a chef de cuisine at Jason Stratton’s Spinasse and Artusi, and finally as the chef de cuisine at Aragona, which opened in 2013. And, of course, there is the whole television star thing. Other than saying she brought her seafood skills to the show, Mashaney is demure about her Top Chef experience. You get the feeling she isn’t really the reality television type. Heck, she spends her free time with friends and family, or in the gym: She and her husband own a CrossFit gym in West Seattle. And that free time is pretty scarce. Which is why it’s a delightful surprise when, as I leave our interview, Mashaney pipes up. “Oh, do you want a recipe?” she asks. Do I want a recipe? More than anything in the world, I think. So, here it is. Carrie Mashaney’s own recipe for geoduck salpicon. Carrie Mashaney, a season 11 contender on Top Chef, is the chef at Jason Stratton’s Spanish-influenced restaurant, Aragona. This is her cool, refreshing salad similar to ceviche featuring geoduck. To prepare celery juice, take a couple stalks of chopped celery with a pinch of salt in a food processor and blend until a juicy pulp forms. Squeeze juice out with a towel. Keep juice cold. Prepare the geoduck by dipping it in hot water for 10 seconds then immediately placing it in ice water. Remove the shell by carefully running a sharp knife between the shell and the body. Start at the siphon end and move towards the back of the clam. The skin will visibly loosen, and can then be peeled off in one piece. Remove the clam’s stomach and other internal organs. This is the circular mass between the siphon and the body. The organs can be discarded or used in chowders and soups. Wash the geoduck in the ice water removing any skin, sediment or sand. Once it is clean and working on a clean cutting board, cut the siphon from the body. Then cut the siphon in half horizontally and slice each half, very thin with a sharp knife, keep cold. The body is usually cooked and can be prepared in a variety ways such as geoduck linguini or sautéed with butter and served over rice. To finish salad, mix the cut geoduck siphon with celery hearts, radishes, chives, lemon zest, a little lemon juice, and celery juice to taste. Season with salt and liberally drizzle with olive oil and mix. It should be pretty juicy. Place in a shallow bowl and garnish with celery leaves and a little drizzle of olive oil. Serve immediately.